This fragrant plant is valued for its dainty foliage and tiny white flowers. 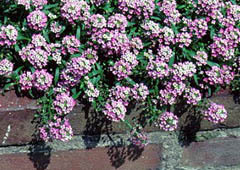 Its creeping habit makes it very useful for edging and for filling in gaps in pathways and stone walls. Easy to start and get to flower even if planted as late as July. Performs best in cooler weather. Propagate by seed - Direct seed in garden in mid- to late spring, or indoors 4 to 6 weeks before last frost. Do not cover the seeds, as they need light to germinate. Varieties come in different shades of purple and pink, varying heights and spreads, some with double flowers (on varieties that florists use) and some with larger flowers. 'Snowdrift': white flowers are larger than traditional alyssum. Grows from 3 to 6� tall. 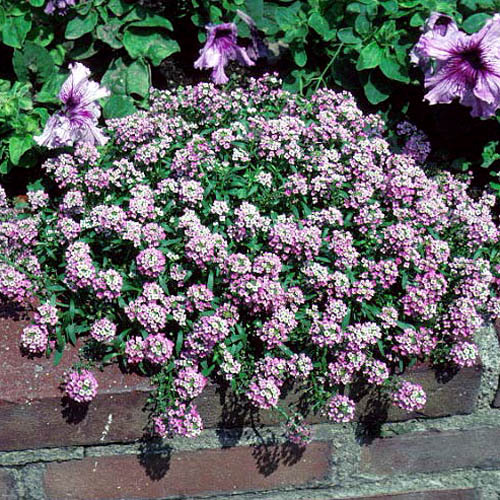 �Easter Bonnet� Series: blooms earlier in the season and retains its mounded shape and attractive appearance longer into the growing season than traditional alyssum. White, purple and pink shades for flowers. �Basket� Series: these plants spread quickly, and are grown especially for hanging baskets. Flowers in shades of white, pink, purple, yellow and peach. �Aphrodite� Series: white, yellow, peach, purple and pink shades for flower colors. One of the few annual alyssum varieties with yellow blooms. �Wonderland� Series: purple, white or pink flowers on compact (3 to 6� tall) plants. �Snow Crystals�: flowers are white and larger than traditional alyssum flowers. 'Rosie O�Day': early blooming, 4� tall plant with spread of nearly 1�. Rosy red flowers hold their color long into the growing season. �Trailing Rosy Red�: rosy pink flowers on long, trailing plants. Excellent for hanging baskets.